One of the key aims at the heart of the Overberg Renosterveld Conservation Trust has always been the pursuit of greater knowledge of this Critically Endangered, little known and highly misunderstood vegetation type. 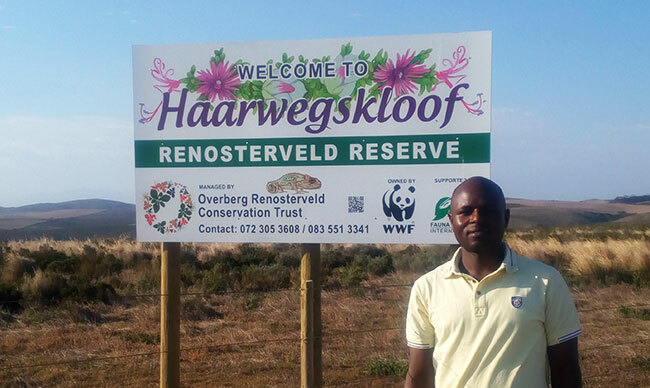 To this end a growing number of postgraduate students from multiple institutions have built highly successful research collaborations with the ORCT, using the purpose-built research centre at Haarwegskloof Renosterveld Reserve as a base for their fieldwork. Dylan Jacklin is undertaking his Masters at Stellenbosch University on ‘The potential use of plant species within Critically Endangered Renosterveld vegetation for the phytoremediation of glyphosate and fertilisers to conserve South African freshwater systems’. The project is co-supervised between the Departments of Environmental and Geographical Sciences and Civil Engineering. His research is supervised by Mr Jannie De Waal (Geography) and Dr Isobel Brink (Water Engineering). Dylan grew up in Gauteng, studying through to Honours at the University of Pretoria. His Honours project looked at water contamination through Escherichia coli in two different groundwater springs, culminating in his current Masters research. Dylan is a self-confessed sports fanatic enjoying cricket, golf, running and mountain biking. Sachin Doarsamy is a first year Masters student at the University of Kwa-Zulu Natal (UKZN) in Pietermaritzburg, supervised by Professor Steven Johnson and Dr. Benny Bytebier. He is interested in phylogenetic relationships between South African Wurmbea species. The genus has two distinct geographic regions of speciation, the Western Cape (16 species) and Kwa-Zulu Natal (five species) and a further three subspecies scattered in the afromontane forests of Africa. In addition to this, limited information is known about the pollination and breeding system Sachin is therefore aiming to unlock this mystery by analysing scent chemistry of this genus and their reproductive ability. His keen interest in Botany developed further when he volunteered at the Bews Herbarium at UKZN during the second year of his first degree. This experience exposed him to the workings of CREW (Custodians of Rare and Endangered Wildflowers) which has a group based at the university. Besides his interest in all things botanical he is also an amateur entomologist with a particularly soft spot for dung beetles and solitary bees. Brian Du Preez started his Masters (MSc) in 2017 looking at the taxonomy and undertaking a systematic revision of the genus Polhillia, which is a member of the Fabaceae or Pea Family. The genus is named after Roger M Polhill, an expert on legumes at Royal Botanic Gardens Kew. Brian’s research is supervised by Prof Leanne Dreyer and Prof Alex Valentine in the Department of Botany and Zoology at Stellenbosch University, as well as Prof Muthama Muasya from UCT and Dr James Boatwright from UWC. All species in the genus Polhillia are threatened with extinction owing to habitat loss and potentially climate change. This study aims to gain a deeper understanding of the taxonomy of the genus will help lead to more effective conservation and awareness. In 2016, when on a field trip with CREW (Custodians of Rare and Endangered Wildflowers), Brian rediscovered 16 plants of Polhillia ignota, which was previously thought to have been extinct and not seen since 1928. Growing up in George on South Africa’s Garden Route, Brian has been an active member of the OUTRAMPS CREW group since 2012. When not working on his MSc, he searches for and identifies other rare and endangered legumes, and has discovered several new species to science. In his spare time he is a keen ballroom and Latin American dancer. 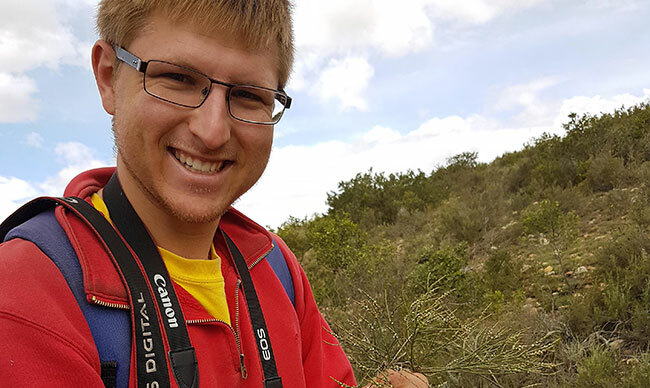 Luke Gallant is doing his Masters research on characterising native palatable legume and non-legume species in Overberg Renosterveld vegetation. He is based at the University of the Western Cape and supervised by Dr. Samson Chimpango and Dr. Igshaan Samuels. This research aims to inform decision making on assessing grazing potential (characterising the nutritional value of native legume and non-legume species for livestock grazing) and informing the potential use of these species as drought tolerant pasture crops as a supplement to the non-native species such as Lucerne currently used. The key findings from his study were that native legume species (Fabaceae) displayed superior levels in terms of its nutritional quality in comparison to its non-legume counterparts. The macro-mineral elements: Nitrogen, calcium and magnesium, and protein content showed greater concentrations in the legume species. The display of the increased protein content can be explained by the high concentrations of nitrogen due the ability of legumes to fix atmospheric nitrogen with the aid of root-nodule bacteria (rhizobia). Legumes are also beneficial to the agricultural system because of the ability to feed these high-nutrient concentrations back into the soil where nutrient may be deficient. These species also displayed lower values in the fibre content, allowing less time and energy spent on the digestion processes in the rumen of the livestock. Overall, there is a positive result of using native species that are of a higher nutritional content as a supplement for livestock grazing to accommodate the demands of using introduced species that would need external inputs such as irrigation and fertilizer. Luke enjoys a variety of outdoor activities such as visiting regular hiking trails and exploring new trails. Also while doing some natural exploration he like to dissect how our interesting natural systems operate and obsesses over all inhabitants encompassed within it, from the smallest insect to the tallest tree. Also a relaxing time fishing at the beach is welcome too. Abigail Widigger undertook her Masters research on small mammal diversity in patches of Overberg Renosterveld vegetation of differing size. Her research was supervised by Dr Pippin Anderson (Department of Environmental and Geographical Sciences) and Professor Jeremy Midgley (Department of Biological Sciences) at the University of Cape Town. This important research helped to shed light on the effects of fragmentation of Overberg Renosterveld through transformation of veld for agriculture on small mammal populations. Despite small mammals being extensively studied in Fynbos, there are just a handful of studies from Renosterveld ecosystems. Abigail’s research revealed a variety of different small mammal species: The most widespread was the Four-Striped Field Mouse, which was found in even the most degraded of Renosterveld patches. Larger patches with a greater diversity of vegetation cover yielded less common species such as the Cape Rock Elephant Shrew and the Bush Karoo Rat. These larger patches were often devoid of the Four-Striped Field Mouse, a generalist species perhaps not suited to the habitat in larger more pristine patches where the specialists thrive. 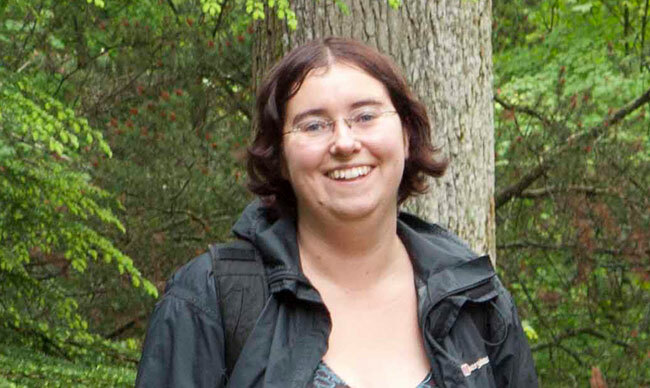 Abigail’s research also found higher species richness in larger Renosterveld patches. This highlights the importance of those few remaining larger contiguous fragments of Overberg Renosterveld for small mammal conservation. In her spare time Abigail enjoys cycling, hiking and growing anything from succulents, orchids, bonsai trees and veggies. Read more about Abigail’s Research here. Daniel A. Zhigila is undertaking his PhD supervised by Prof. A. Muthama Muasya and Prof. G. Anthony Verboom at the University of Cape Town. He is working on “Molecular phylogeny and climate change responsiveness of Thesium L. (Thesiaceae)”. Employing an approach that integrates taxonomic and systematic methodologies with species distribution modelling, his goal is to use Thesium as a case study for the Overberg flora: (i) to develop a robust and well-resolved phylogenetic hypothesis for Thesium; (ii) within a phylogenetic comparative context, to assess the correlates of range size variation, endemism, rarity and (iii) to develop distribution models for species and use these to assess the extinction risks associated with accelerating climate change. Of the 84 Thesium species reported in the CFR, 42 are from the Overberg region. 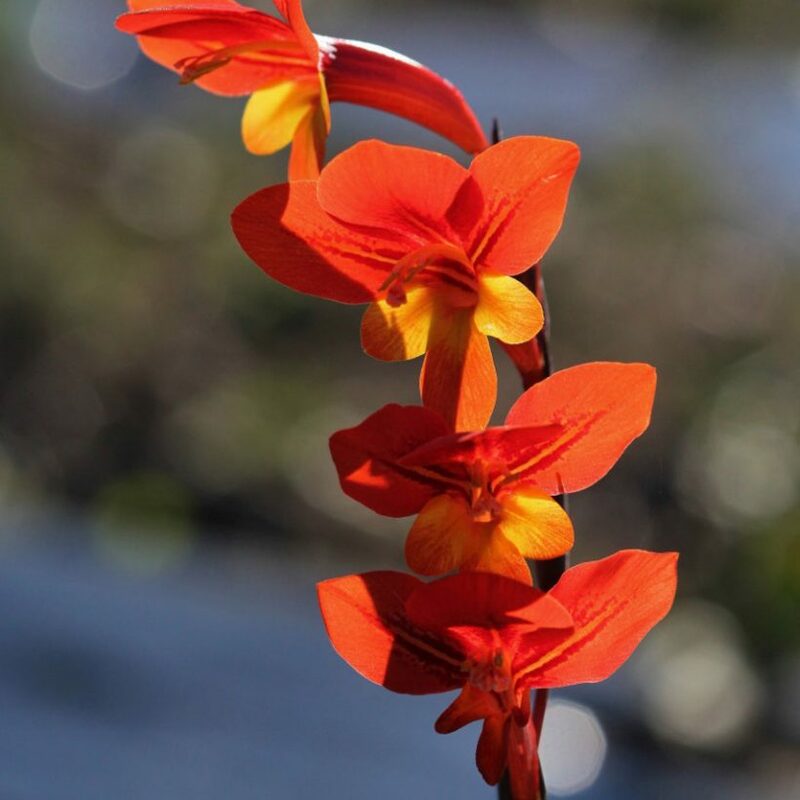 Amazingly, during recent field trips to Haarwegskloof Nature Reserve and the surrounding quartz patches, eight Thesium species were recorded, five of which are new to science and three are endemics. Taxonomic descriptions of the new species are underway, morphometrics and molecular phylogeny have been completed. Up next is the biogeography component of the research – climate change responsiveness, rarity, endemism, speciation and evolutionary implications. 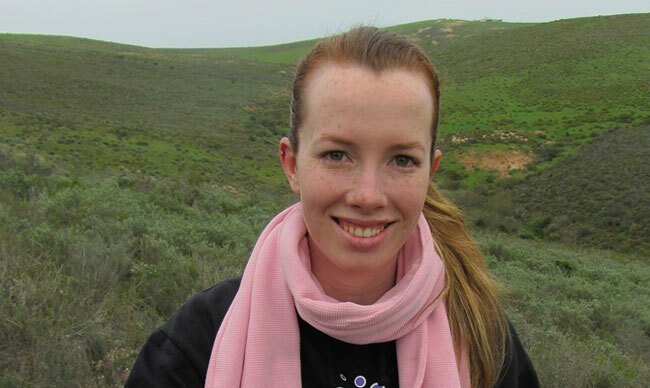 Zoë Poulsen is a Doctoral student in the Department of Biological Sciences at the University of Cape Town undertaking conservation-focused research into restoration and rangeland ecology of Overberg Renosterveld. Her research is supervised by Dr Samson Chimpango, Prof Muthama Muasya, Prof Timm Hoffman and Dr Pippin Anderson. The project examines the impact of grazing on Overberg Renosterveld vegetation from a variety of different perspectives: What impact does livestock grazing have on this Critically Endangered vegetation? To what extent can it be used as a management tool? How effective is passive restoration in restoring overgrazed Overberg Renosterveld? What is the impact of livestock grazing on the soil stored seed bank of this vegetation type? Originally from the green and gently rolling landscapes of England’s West Dorset, seven years ago a lifelong interest in plants and their ecology brought her down to the Cape. When she isn’t hard at work Zoë can be found hiking the mountains of the Cape Floristic Region, participating in various community based-conservation initiatives as well as enjoying gardening, landscape photography and cooking home-grown produce. She is also the author of the blog ‘Notes from a Cape Town Botanist’. 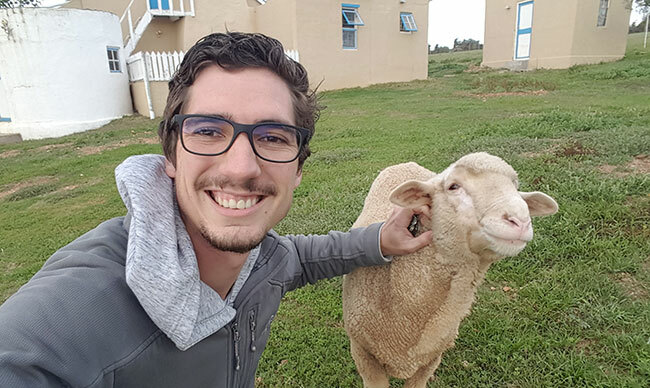 Oliver Cowan is undertaking his PhD research on investigating functional ecology in Overberg Renosterveld with a view to informing future management and restoration interventions. Functional ecology investigates the role that different species play in the ecosystem communities in which they occur. 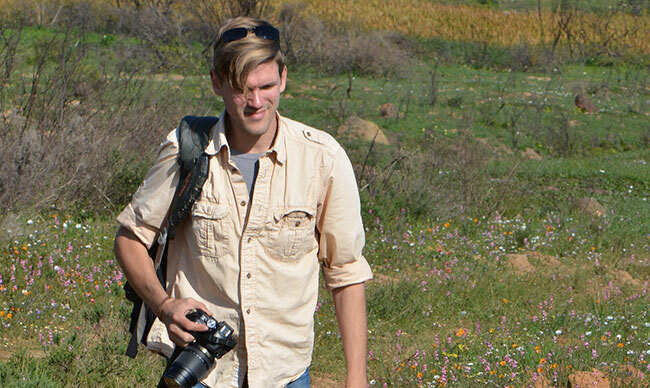 Oliver’s research encompasses a variety of different topics within this field, from building knowledge of the under explored world of pollinators in Overberg Renosterveld to vegetation and faunal activity in soils of this complex and under-researched ecosystem. Oliver’s research is supervised by Dr Pippin Anderson in the Department of Environmental and Geographical Sciences at the University of Cape Town (UCT). 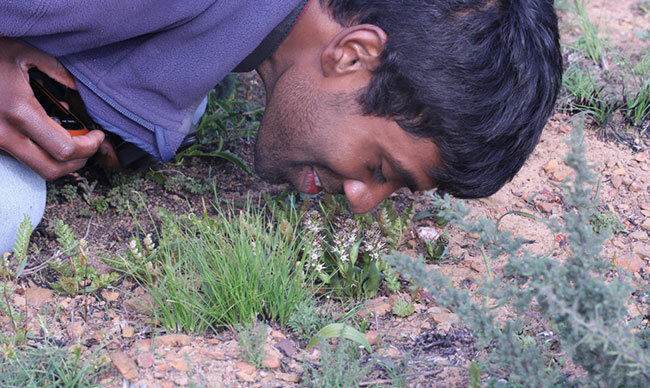 He also undertook his Masters at UCT looking at restoration of Critically Endangered Peninsula Shale Renosterveld. 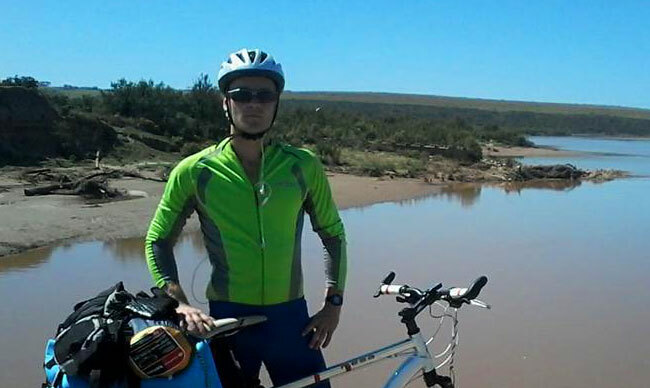 Oliver is a keen cyclist and before starting his PhD cycled the length of the African continent, including across the Overberg as part of his long journey. Ethan Newman’s research interests lie in the mechanisms that give rise to the immense diversity of flowering plants. In particular, his PhD investigated the role of pollinator shifts as drivers of floral variation in a long proboscid fly pollination system. One of the most important findings from this research shows that different forms of Nerine humilis with different style lengths are locally adapted to the morphology of their local pollinators. Namely, populations with short styles are visited by various insects with short proboscides and populations with long styles are visited by long proboscid flies. At Haarwegskloof an unusually long styled form of Nerine humilis was discovered with styles more than 4cm in length and despite several attempts to find the pollinator, one can only speculate that the long proboscid fly pollinator has gone extinct locally. This same pattern has also been observed in other long style populations, which suggests a fitness cost associated with being specialised to a single species of long proboscid fly. This research is an extension from the work from Ethan’s PhD and is near completion. 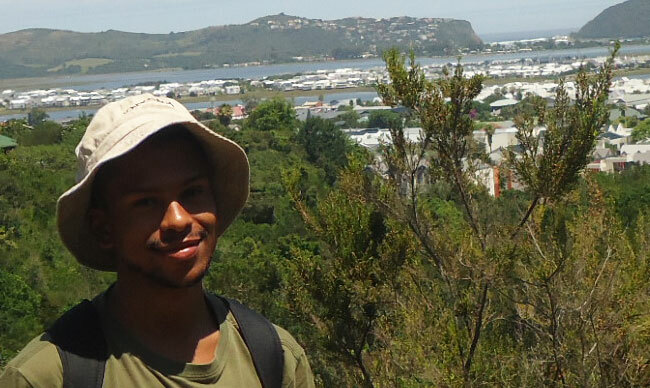 Ethan is currently based at the University of Kwa-Zulu Natal where he is doing his post-doc with Prof. Steve Johnson. In his free time he enjoys fishing, hiking, botanising, gardening and reading. Read more about Ethan’s Research here. Evan Eifler is a Doctoral student at the University of Wisconsin-Madison in the USA undertaking his research on the ecology and evolution of Geissorhiza (Iridaceae). He will be building a family tree for the genus using DNA markers to reveal the drivers of speciation that have generated this strikingly beautiful and largely endangered botanical radiation. He is supervised by Professor Henry Allan Gleason (Professor of Botany and Environmental Studies) and Dr Tom Givnish. Though the family tree is far from complete, Evan is excited that this season he was able to find Geissorhiza radians (the radiant winecup and symbol of the Darling Wildflower Show) and the four other endangered Geissorhiza species that all look almost exactly like it. He will be collaborating with Professor Steve Johnson (UKZN) to uncover exactly how this case of pollinator-driven convergence evolved. 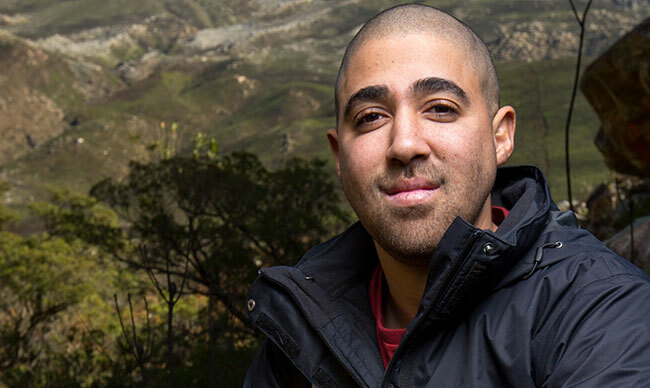 Prior to his PhD he spent a year working in collaboration with the Overberg Renosterveld Conservation Trust funded through a National Geographic Young Explorers Grant and crowdfunding. This project was entitled ‘Recognising the Renosterveld’ and encompassed both the use of photography and biodiversity surveys to document the Critically Endangered biodiversity of Renosterveld fragments, while feeding back to farmers through use of written reports. In his time off, Evan likes to hike, spend time at the beach, cook for friends, and take care of his roughly 80 houseplants. Come for the day, or spend a night or three in our Renosterveld Reserve. There are a number of reasons to visit: the plant life (our reserve has over 400 plant species), the rich bird life (over 80 birds), and of course the mammals, amphibians, reptiles and invertebrates that occur here.